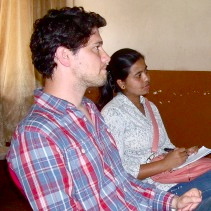 Raymond Aycock (Jagaran Media Center-JMC): Raymond received his Master of Arts degree in International Policy Studies with a focus in Conflict Resolution from the Monterey Institute of International Studies (MIIS). During his studies he undertook research in Nepal and India that focused on identity aspects of conflict among marginalized social groups. After his fellowship he wrote: "That’s why the work at Jagaran Media Center is so important. They are working on the structure that allows rampant discrimination, and not just reacting to an event. It is the sort of approach that will change the way society thinks about caste and caste-based discrimination and hopefully go a long way towards redefining what that societal structure actually means." I have landed in Nepal. It is the monsoon season, so it rains every day.